If you are looking for all-purpose inflator that can be used anywhere, be it at home or on the trip, then Husky 12-Volt/120-Volt Inflator fit for this best. It was a great idea to combine the automotive and home inflators in one quality product. You can use it at home or in the garage, simply by connecting it to the home power source. Also, you can put it in the car, going on a journey and at any moment you can inflate your ball, mattress, bicycle tires or car tires simply by connecting it to the car power source. You do not need to purchase a several inflators or to choose between 12V or 120V inflator. By choosing this universal 2-in-1 Husky 12V / 120V auto and home inflator, you not only save your money because you purchase only one inflator instead of two, you get an inflator that is capable of operating in both at home and in the car. The maximum pressure that it can provide up to 120 PSI. It has an electronic pressure gauge, which automatically shut down the inflator when the desired pressure is achieved. To control the pressure 12/120 volt inflator has a large LCD display. 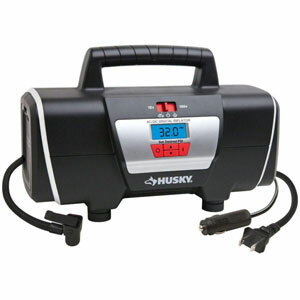 Husky all-purpose Inflator has a convenient handle for portability and also it is very light. In addition, it includes accessories such as: 2 sports needles, 1 raft nozzle, 1 presta valve adapter. Your opinion can help people like you to make the right decision.